HomeLifestyleWhat Temperature Should You Dab At? 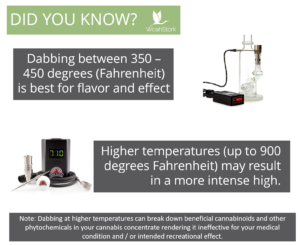 The industry and what little scientific literature exists on the subject seems to agree that dabbing at 350℉ to 450℉ is the best for flavor and effect, though higher temperatures — up to about 900℉ may make for a more intense high. 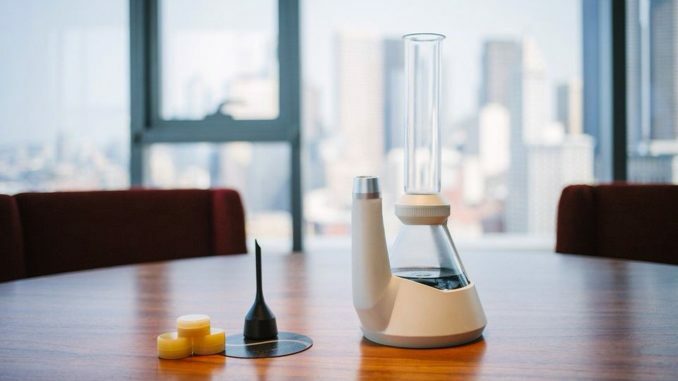 Often when dabbing, people set their rigs too high or use too much heat from a torch to avoid an oily residue left over from wax or shatter (oil is often produced using a different distillation method and is easier to use exclusively with vape pens). While a higher temperature and more flame may burn up this excess oil, it can also break down the beneficial cannabinoids and other phytochemicals in your cannabis concentrate. 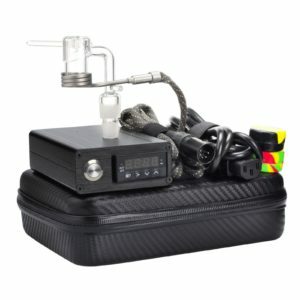 Setting your electric rig too high, or blasting the wax too hard with a torch can result in a harsher high that doesn’t include the benefits of whole-plant extracts, may injure the throat and lungs and could even release toxins from solvents and pesticides used in the production process. Dabbing with too much heat may also cause the combustion breakdown into harmful components the otherwise beneficial terpenes that occur naturally in cannabis. What temperature should I set my nail at for dabbing? Likely because people often inhaled wax or shatter from the end of a nail after heating with a blowtorch, the term “nail” now refers to the small dish or surface that holds the cannabis concentrate for heating, whether electrically or not. According to cannabis industry literature and studies by a company that manufactures nails for electric rigs, the actual surfaces temperature of a nail is usually about 50℉ to 100℉ less than what you set the heating element to. The hardest part of telling what temperature to dab at is actually knowing the temperature your nail is set to. Fortunately, e-nails allow you to set a specific temperature instead of “guessing” by using a blowtorch. The composition of the nail — whether titanium, ceramic, quartz or other materials — also makes a difference. For instance, according to studies by the manufacturer D-Nail showed one of the manufacturer’s titanium nails was only a few degrees cooler at the coldest part of the dish than the surface of the heating coil itself. One of the company’s quartz nails, however, was about 70 degrees cooler at the coolest part of the dish than the coil surface. To judge your own electronic nail, look at the manufacturer’s literature and experiment with different heat settings to figure out the best one. Don’t have a nail? Follow this pro tip: Use your blowtorch on your nail and then place your pointer and index fingers half an inch above the nail. Keep it there until you barely feel any heat. This should let you know that you’re at a safe dabbing temperature.